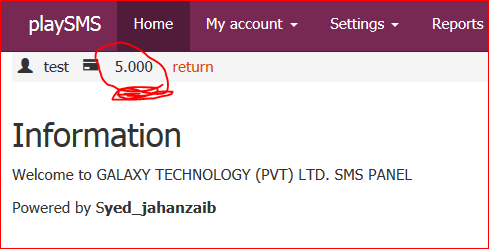 May | 2015 | Syed Jahanzaib Personal Blog to Share Knowledge ! In this example I had TELTNOKIA SERIAL Modem (Model: Teltonika ModemCOM/G10 Serial ) attached with Linux base system [Ubuntu 12.4]. 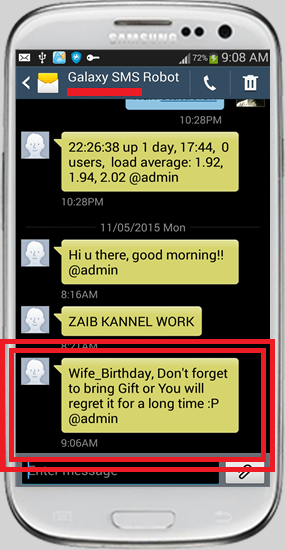 This system had kannel/playsms installed which sends sms alerts for various events and can trigger different scripts upon receiving SMS with specific codes or instructions. I created this script which run daily in morning sends email info / alerts for any issue related to modem and sim balance. on internet there might be some better guides or methods to do the same task, but this one fulfilled my custom requirement with my text. Sharing this script, maybe some one will get benefit from it or improve it on a pro level. GAMMU must be installed and must be configured with the modem. you should run gammu –identify to make sure its detecting the modem. 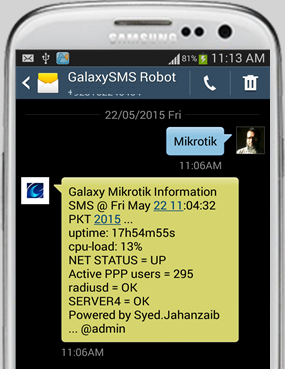 # Script to check Modem status and SIM balance via GAMMU and send email alerts accordingly. echo -e "$CURDATE Checking for old garbage files created earlier tby this script"
echo -e "Checking MODEM status"
# Look for Modem string , if not found give error and exit. echo -e "$CURDATE Modem NOT Responding.."
echo -e "Modem seems to be responding OK"
echo -e "Now executing USSD code FOR ZONG MOBILE SERVICE via GAMMU"
# Look for word insufficient in above output file, if found then give error and exit. echo -e "Balance & Modem both OK, Alhamdolillah"
echo -e "Balance is:  $BAL"
echo -e "Modem Reponding but ZONG SIM may have not enough balance"
Its just rough notes, you must modify things according to your network and requirements. Sharing another theory which can actually work and can be modified to perform about any function which is accessible by web panel in DMASOFTLAB Radius Manager. Do remember that this is just an lab test scripts , in reality radius manager do add few other info in different tables and places. 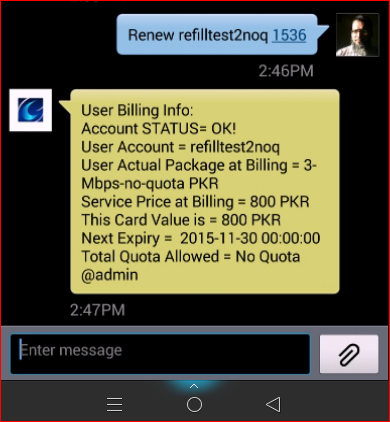 RM recharge method is somewhat quite different then other billing systems. For the demonstration purpose only, I selected an short route by bypassing all extra codes and just added 30 days in the user account via script . These are just my own thoughts in old days. Lot of improvement can be made in this regard but all of these things requires dedicated time 🙂 Hope you understand. 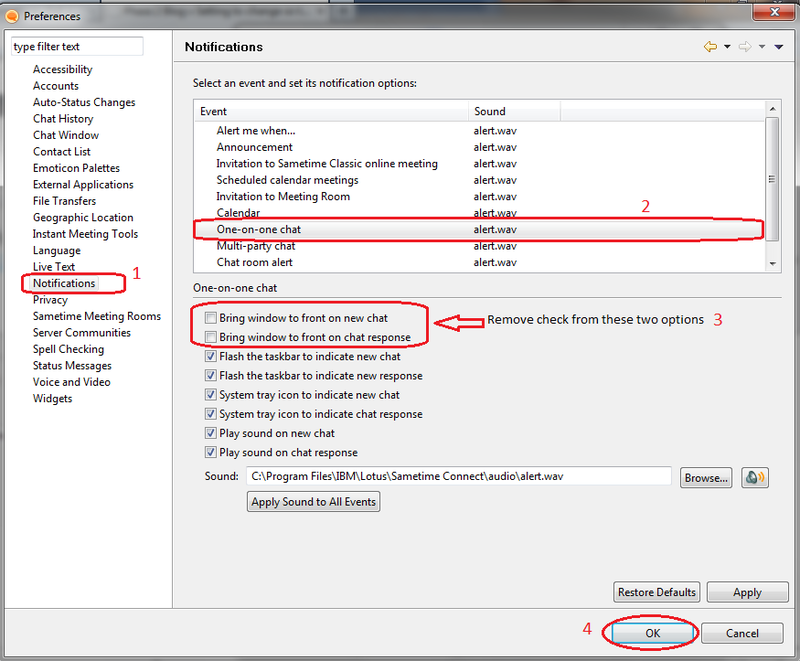 and if required you can send report via EMAIL to admin or the user as well including many details you like,. Create REFILL cards so that we can use it to refill our expired account. Make sure your service have PRICE defined, and the refill card you generate are equal or higher then the service price. echo -e "ERROR: INVALID CARD NUMBER!" 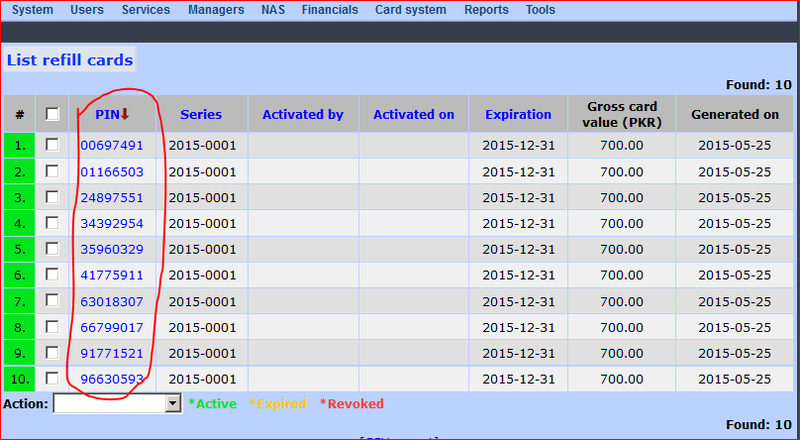 echo -e "ERROR: CARD PRICE IS NOT SUFFICIENT TO REFRESH $PKGNAME SERVICE"
echo "Account have been EXPIRED TODAY! Last LOGOUT date was $LOGOFFDATE"
mysql -u$SQLUSER -p$SQLPASS -e "use radius; UPDATE rm_users SET comment = 'This account was last refresh from scratch code by SMS' WHERE username = '$USR';"
mysql -u$SQLUSER -p$SQLPASS -e "use radius; INSERT INTO rm_syslog (datetime, ip, name, eventid, data1) VALUES (NOW(), 'n/a', 'SMSUSER_$USR', '$USR', '$USR renewd service > $PKGNAME');"
mysql -u$SQLUSER -p$SQLPASS -e "use radius; UPDATE rm_cards SET owner = '$USR', used = NOW() WHERE cardnum = '$CARD';"
echo "ACCOUNT WAS EXPIRED on $SRVEXPIRYFULL ! Last LOGOUT date was $LOGOFFDATE"
mysql -u$SQLUSER -p$SQLPASS -e "use radius; UPDATE rm_users SET comment = 'This account was last refresh from scratch code by SMS';"
mysql -u$SQLUSER -p$SQLPASS -e "use radius; UPDATE rm_users SET comblimit = '$PKGQUOTAB' WHERE username = '$USR';"
echo -e "Total Quota Allowed = UNLIMITED"
echo -e "Total Quota Allowed = $PKGQUOTAB GB"
As showed in the image below ..
and if all conditions matched like user name and card number valid, then it will execture the rest of script and will add 30 days expiry limit to the account (so if the account is expired it will be re-activated). It will also check if total quota is implemented on the service, it will add the appropriate quota as well. and if user is invalid, it will let you know as well. You can also see its entry in SYSLOG and user properties comments section as well. Lot’s of possibilities here. You can add more details in the script to do more Logging , send alerts etc etc . All depend on your capabilities and passion towards achieving the Goal ! 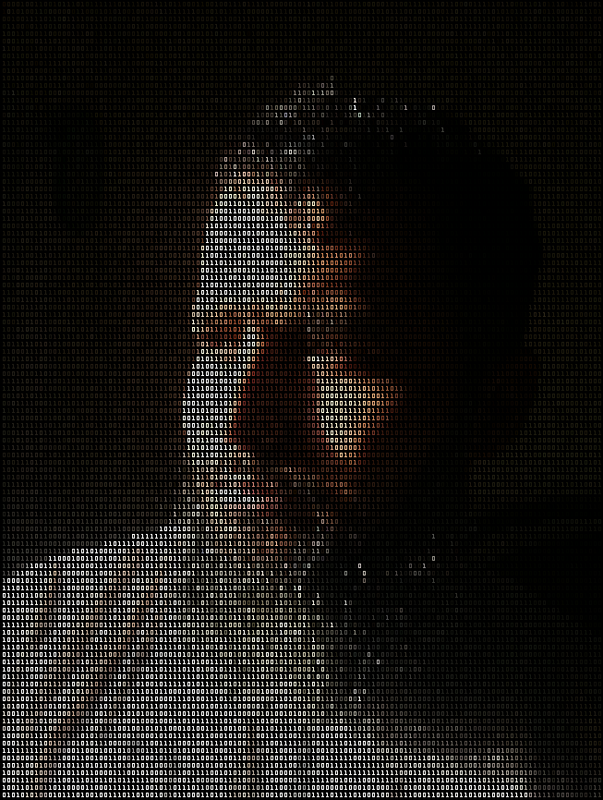 If time will allow, I will add more details Insha Allah ! 08/06-2015 – Added individual dealer’s online users details according to VLAN, and user current online status with quota limits showing like data assigned, used and remained. 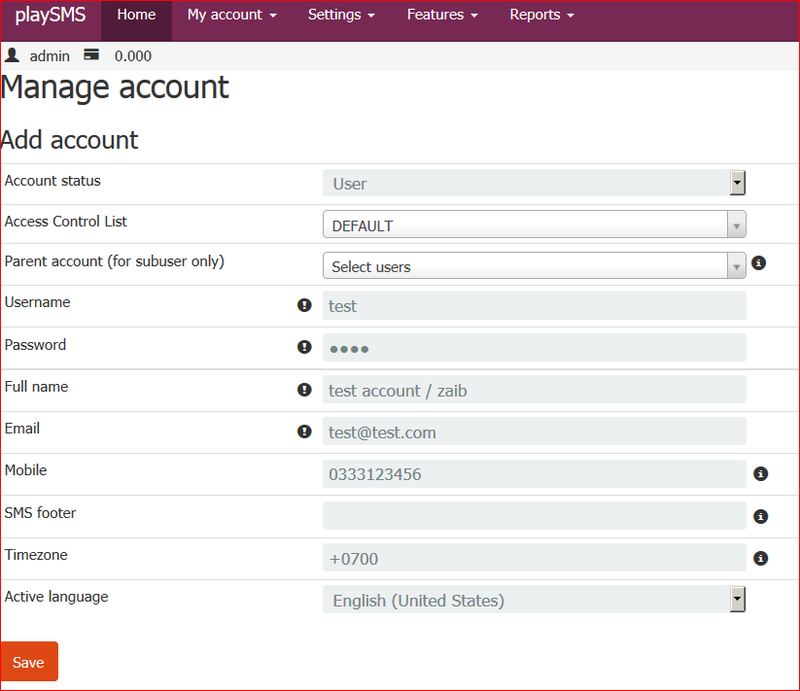 Recently I was working on a SMS reporting system to somehow receive some specific information for the Mikrotik health & Radius server information via sending an SMS and it should reply back the required information in some user friendly format. In the beginning it seemed fairly an easy task to accomplish by simply ssh (pass-wordless) to mikrotik and get the required info, BUT … executing the script from the terminal was working flawless, but executing this script from the playSMS was returning command_output EMPTY for ssh $variables. It took almost 15-16 hours wall banging efforts and finally I took another long route in order to achieve my task. You may find many other short routes to achieve this task, but I managed to get it working this way. Share your thoughts please. 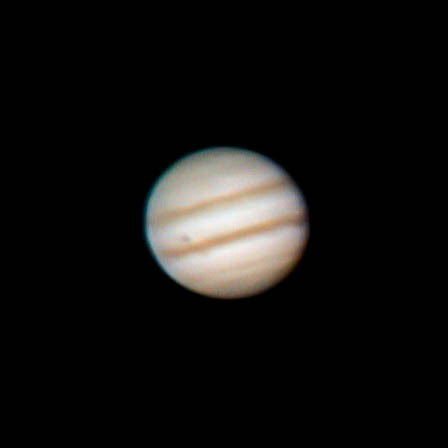 My First Picture of ‘Jupiter’ planet taken with 10″ manual Dobsonian with AFOCAL method, It’s an amazing experience when you see the planet from your Eyes Live ! 2- Linux base System, I used my existing radius server for this purpose. It already have Kannel+playSMS configured with Dlink USB DWM-156 Modem. It can also ssh to mikrotik without password using per-configured public keys. So you should read following guides before proceeding further. Here is the main script which will actually perform all the required actions and will gather information from mirkotik and radius itself. 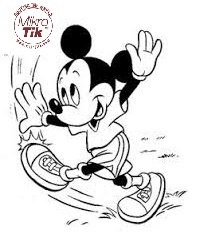 echo "ALERT ..... MIKROTIK $MIKROTIK  is DOWN"
echo "Galaxy Mikrotik Information SMS @ $DATE ..."
echo -e "ERROR: Mikrotik is live but it's SSH not accessible. Its a Mikrotik level BUG, You MUST upgrade with latest version. zaib"
# Extract Netstaus value from the csript we ran earlier on mt. echo "NET STATUS = $NETSTATUSVALUE"
echo "Active PPP users = $ACTIVE"
echo -e "$SERVICE service is NOT running, trying to start it ..."
echo "ALERT ..... SERVER4 $SERVER4 is DOWN"
echo "Powered by Syed.Jahanzaib ..."
At mikrotik you should create and script which will actually check the internet status and update environment variable which we will fetch and use later via cat/awk. # Do not modify data below without proper understanding. 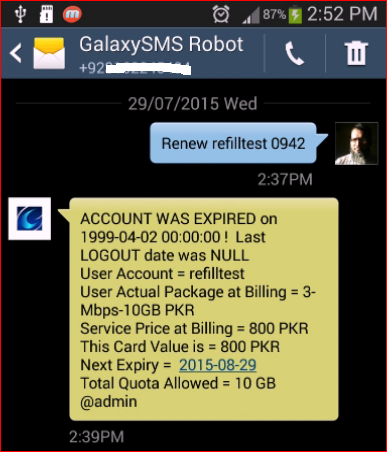 :log warning "smsRESULT: PTCL LINK RE - CONNECTED with new WAN IP = $currentIP, Please check and confirm / zaib"
Another version which have some extended details like each dealer online users count which is helpful for dealers who can send sms to query there online users. script can be modified with security code or individual dealer by adding directives. echo "Total Active Users = $TOTACTIVE"
echo "Dealer = No. Of Online Users"
Mikrotik is configured with User Manager. This one is a very basic task. It does not involve any code to profile match check. 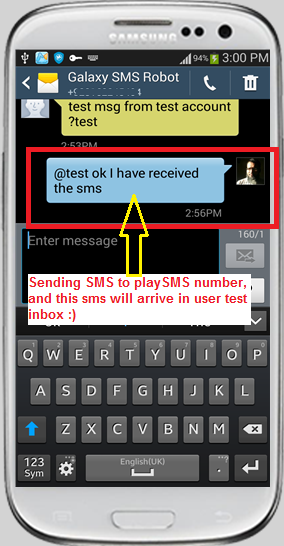 In this method user send sms with his Username and the scratch CODE. Once the server will receive the sms, it will first check the USERNAME at mikrotik, if it found valid username, it will then check the CODE in local text files (in this example I created 3 files, 512k.txt 1mb.txt and 4mb.txt , script will check all of three files (infact *.txt files) and if it found the CODE, it will then ssh to mikrotik and re-activate the user account with the given code profile. if the code belongs to 512k, it will re-activate user with 512k profile, and if the code is from 1mb pacakge, it will re-activate the account with 1mb profile. 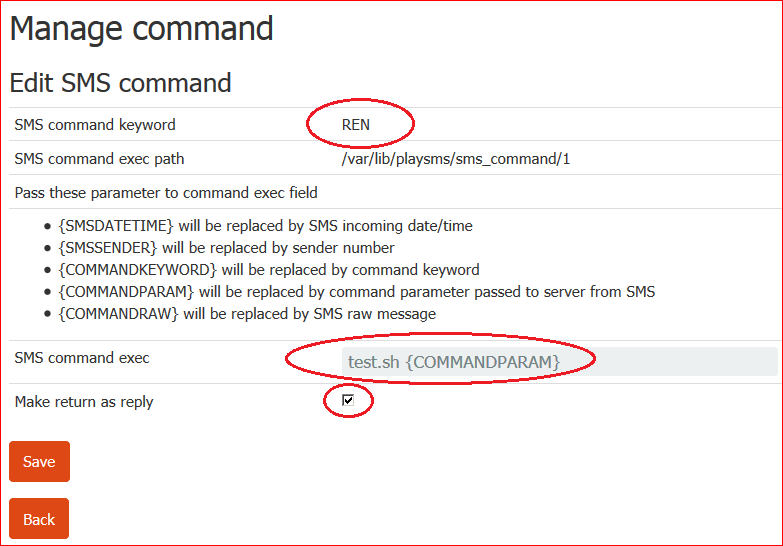 REN is a keyword which SMS server will catch and consider it as renew command. Create following SCRIPT on SMS Server. echo -e "User name - $USR - found with profile reported by Mikrotik = $validuser"
echo "Scratch CODE is valid & found in $VAR1 Package. " ssh admin@$MT /log warning \"$USR account have been renewed by scratch code $CARD at $date \"
echo "Your Account have been Renewed on $date"
Following script will reboot Linux server upon receiving SMS with protection code (password) adn this password must match with the /temp/password.txt content. echo "No reboot code is supplied. Quitting Now !" echo -e "Reboot code OK. This machine will reboot after 1 minute." 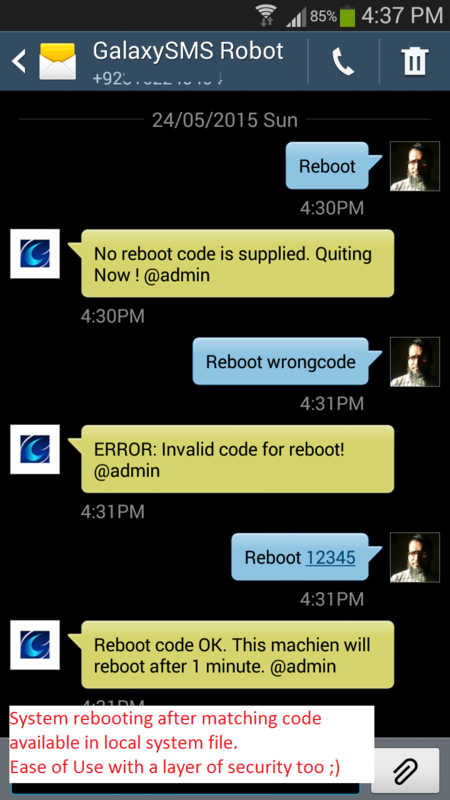 echo -e "ERROR: Invalid code for reboot!" 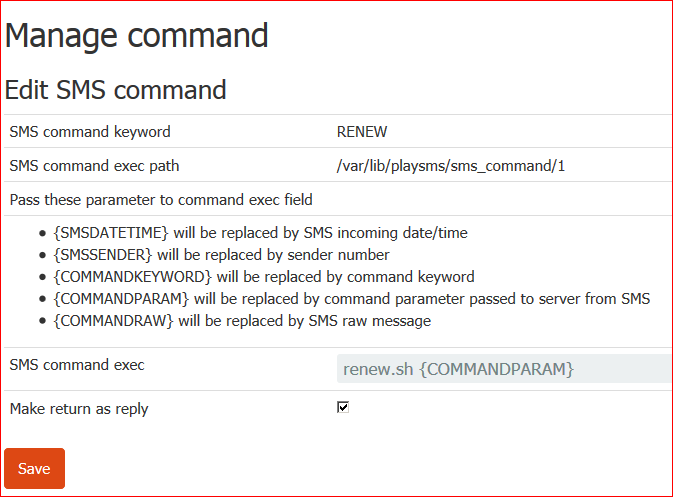 Now create COMMAND from the playSMS menu. 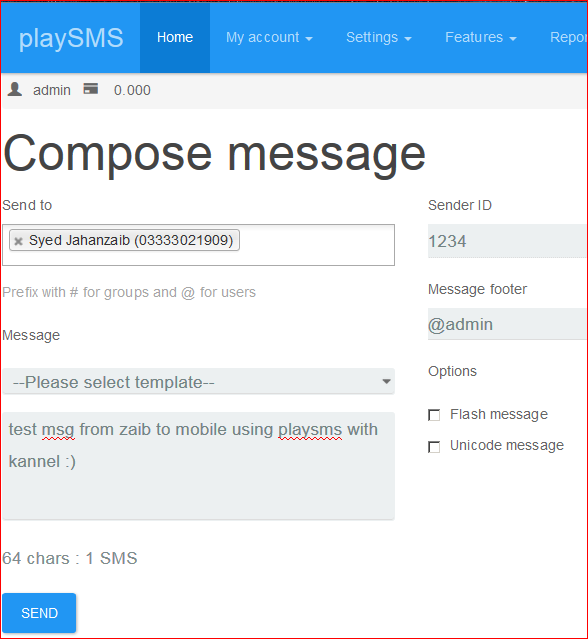 Note: This post is a drafted version which used beta version of playSMS at the time of writing. You may install latest stable release. 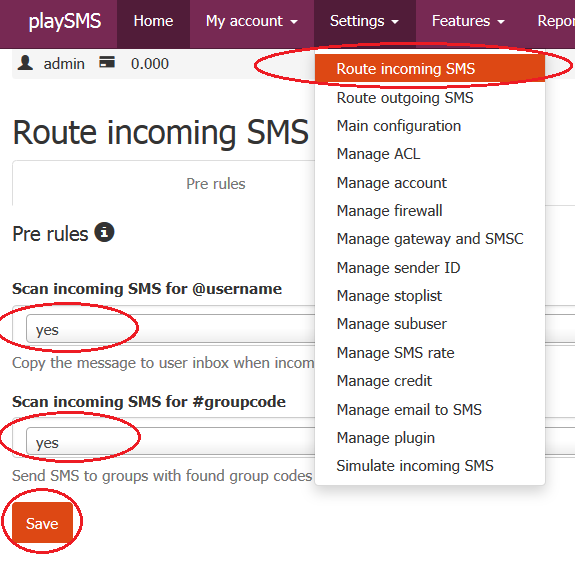 Recently I installed playsms at a network [where Radius manager along with Kannel was already configured to send sms notifications to subscribers] and after seeing playSMS amazing features , I thought to share some basics of it. I found that many guides available on the internet for installing playSMS are either for older versions or with much manual methods which can be sometimes confusing for the beginners, therefore I decided to write an easier version of installation guide of playSMS. 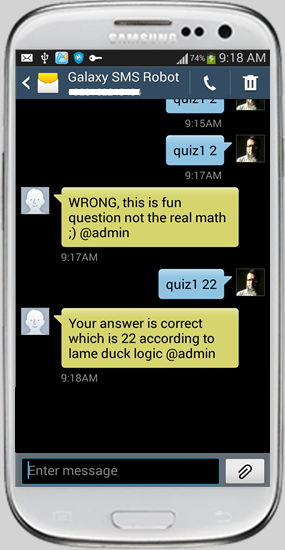 So what is playSMS ? 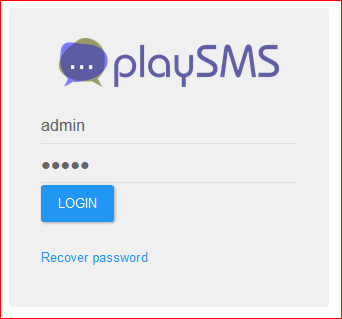 playSMS is a Free and Open Source web base SMS management software. designed by Mr. Anton Raharja at http://playsms.org. Since its open-source application therefore you can adjust it to suite your need, modify it as per your requirements and it can fit with other gateways as well like Kannel (which I have used in radius box). 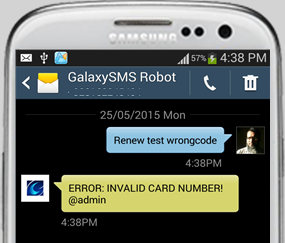 It can receive sms and act accordingly, you can create POLL, Quiz, subscription to any list/package via SMS. SMS 2 Email, Refresh user account via sms using scratch card like wi-tribe or some other ISP’s offers, or mobile companies like send sms to specific number with the specific text and scratch number, inquire system detail , execute specific command, etc etc. I used playSMS in conjunction with Kannel. 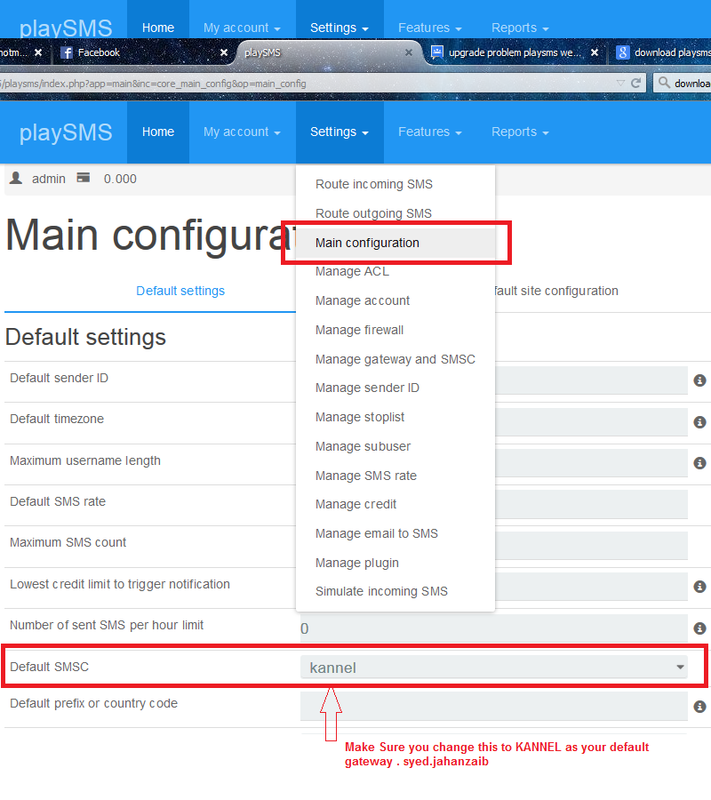 So you should configure Kannel first and make sure you can send sms via kannel. You can follow my guide to install KANNEL first. Since its a long post with various section, I will update various section accordingly. 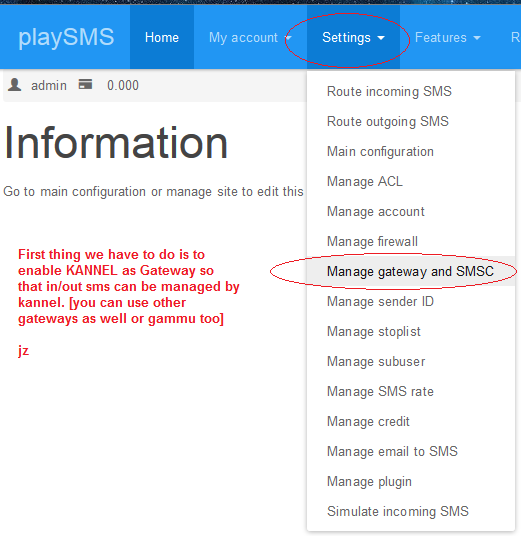 As I mentioned in the beginning, I used KANNEL as gateway for playSMS, so you should configure KANNEL first and make sure you can send sms with it. 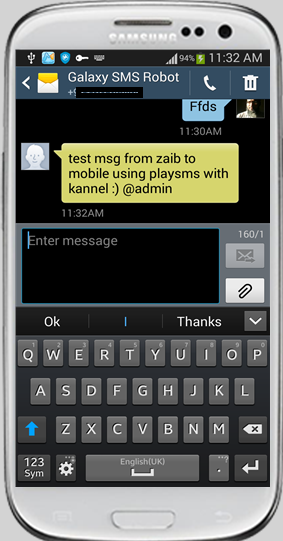 Once successful, then you can add/replace following SMS_SERVICE section in /etc/kannel.conf to make playSMS handle the received SMS. 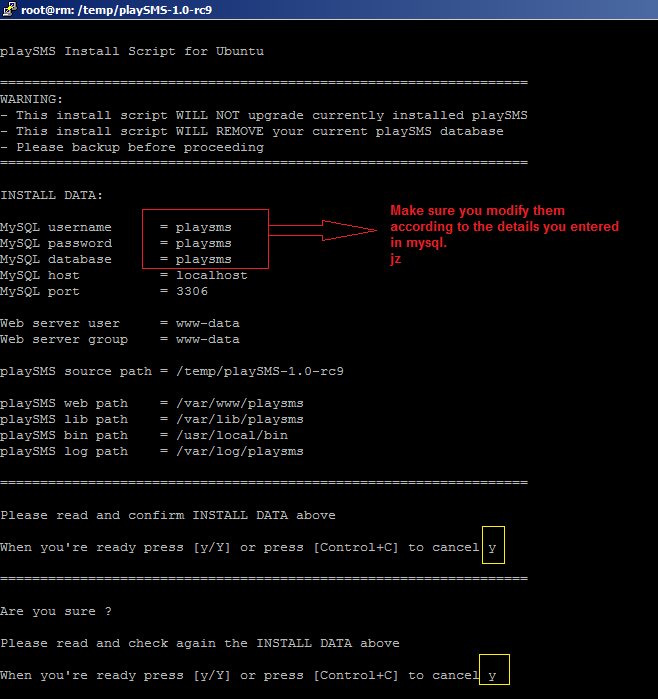 3- PLAYSMS [ver 1.0-rc9] Install Instructions for UBUNTU OS. As usual first update Ubuntu , then install require packages. mysql -u root -pROOTPASS -e "grant usage on *. * to playsms@localhost identified by 'playsms';"
Now edit install.conf and change the info as required, like db name, mysql id password. The installer script uses this file to pick values and install the package accordingly. So make sure all directives are defined properly before firing up the actuall installation script. Once you done editing info, press b to continue & it will continue to install the playsms. 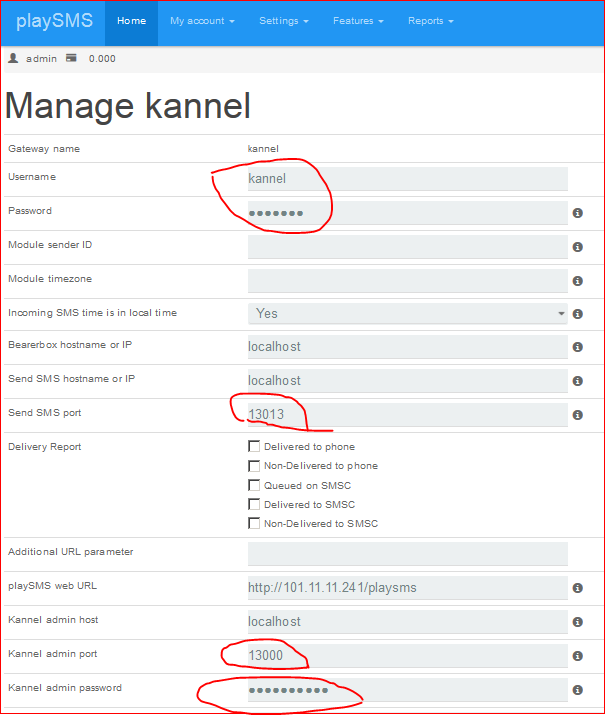 After successful login we have to first configure GATEWAY pointing to KANNEL to send receive sms using kannel as our main gateway. You can skip kannel or use other gateway too depend on your choice, but since I was already using kannel because of Radius Manager, so I simply used it because of its versatility and highly customization. Now in the List of gateways, click on edit button (wheel) next to KANNEL. Now at Manage Kannel window adjust the parameters according to your old kannel configuration. pay attention to username password & proper ports. 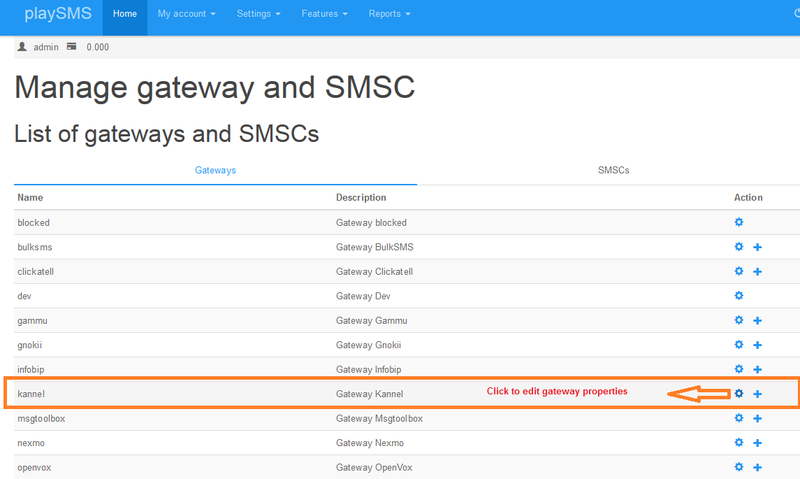 Open Manage Gateway page again and click on + sign to add KANNEL as your gw. Ok its time to hit the road. for some test. Goto My account / Compose Message and send msg to any number. and you should receive it on your handset. 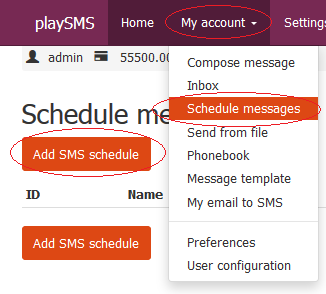 Using playSMS, we can create user accounts and add credits in it, so when user sends sms, balance would deduct from his account automatically , and once his balance finishes, he wont be able to send sms. 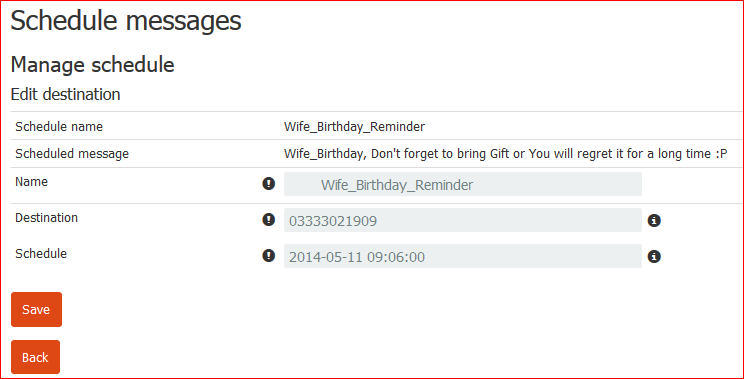 User will be assigned with an ID and Password, He can send SMS via web panel, also he can receive SMS (the other party must reply to or send sms with @username in his sms in order to receive it in specific user inbox). 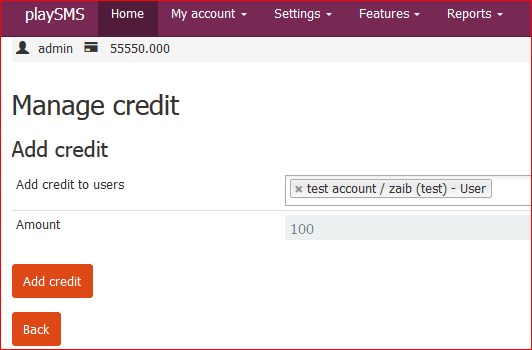 Now we will create a test user account and will add credits in it too. Add the details as required and click on SAVE. 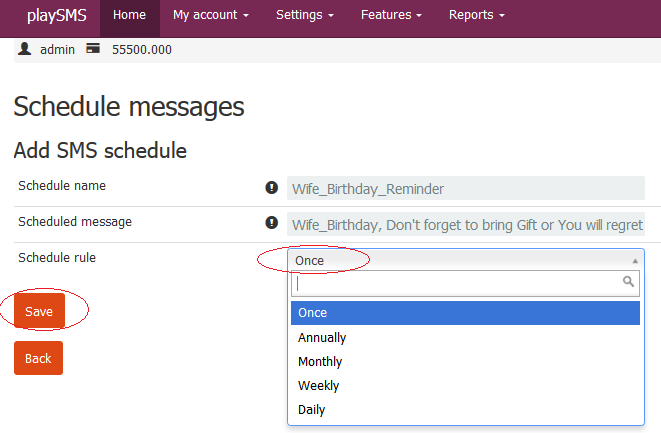 Howto receive SMS in user INBOX ? You have to inform the sender that they have to add @username in there sms , otherwise SMS will receive in SANDBOX, not user inbox. 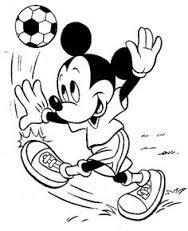 “@test Ok I have received the sms” and send it to playSMS mobile number. 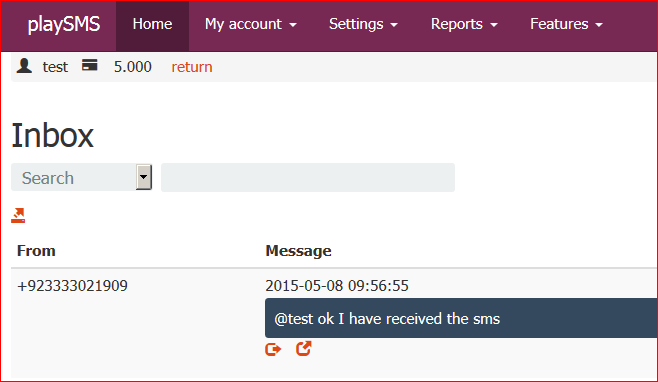 Now the user test can goto My Account / Inbox and there he can see the received SMS. 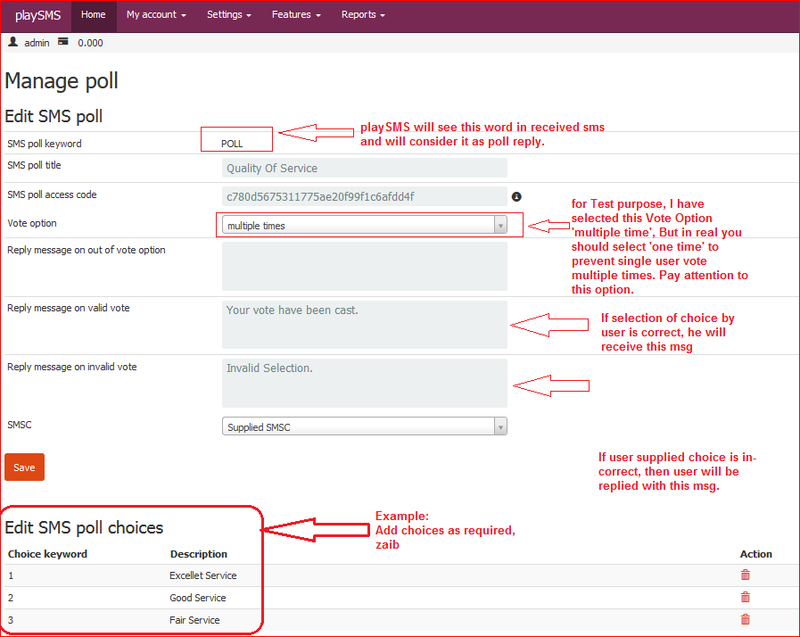 You can create SMS poll system in playSMS, a kind of voting system as well so user can send sms to playSMS mobile number with his choice , and his entry will be made in the poll and will be visible via web page or likewise. For example network operator wants to know how user feel about his network services. Follow this. Now Go back to MANAGE POLL , you will see Orange box on your newly created poll, which means its not activated yet, So simply click on the orange box to make it ACTIVE. 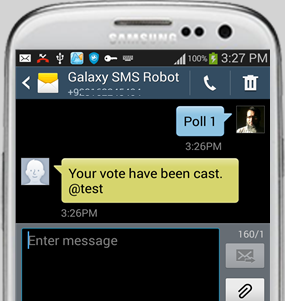 Now to cast vote, send SMS (with different choices multiple time for test) from user to playSMS number. 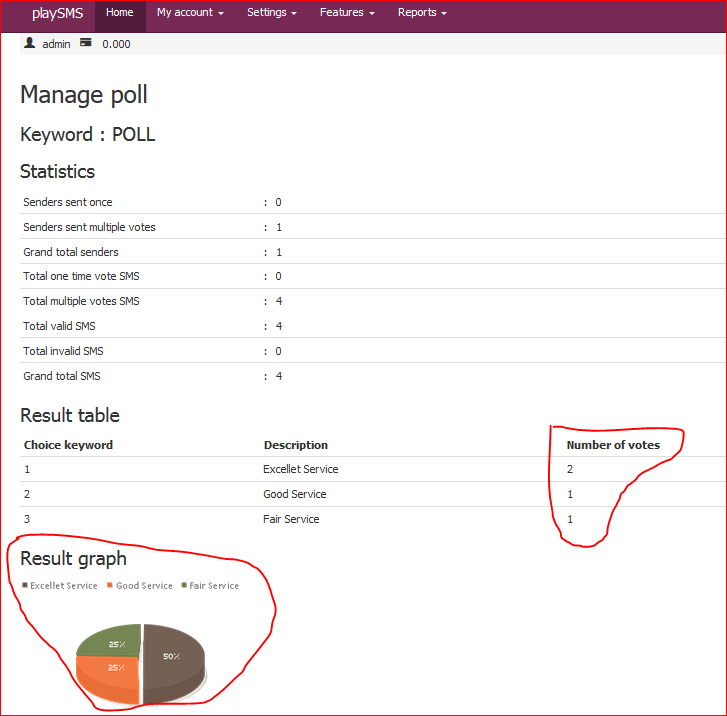 Now to view POLL TEST result, goto Features / Manage POLL, there you will an EYE icon next to your POLL, click on it and you will be brought to POLL details. 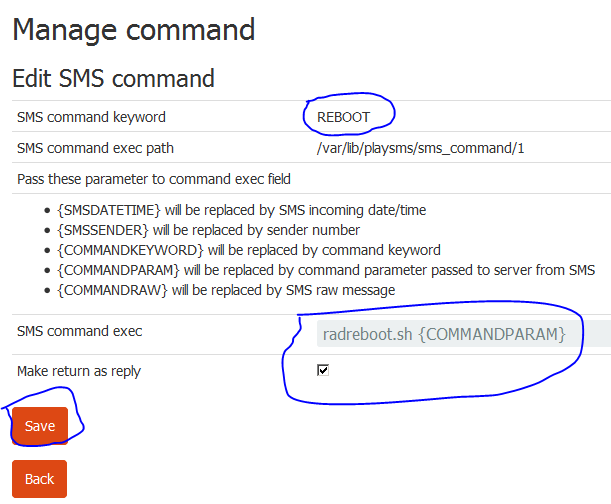 You can create COMMAND base system and can execute script on the playSMS server, and it can reply you back with the result. 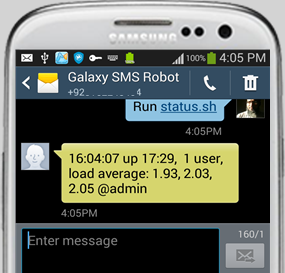 For example If we want to inquire the UPTIME details via SMS. 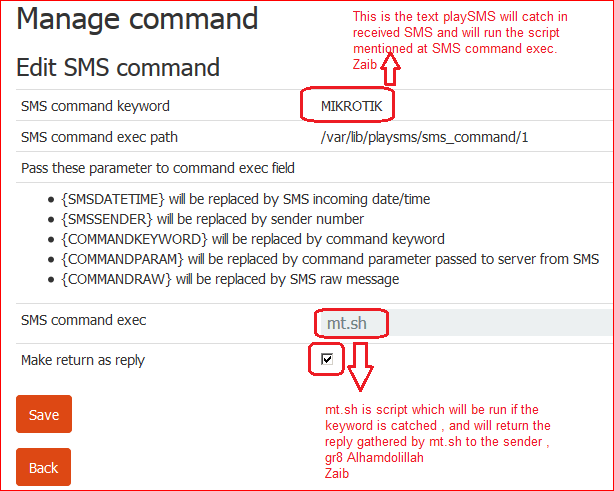 in SMS command keyword, add the catching word which playSMS will detect and consider it as COMMAND sms, and will run the command. 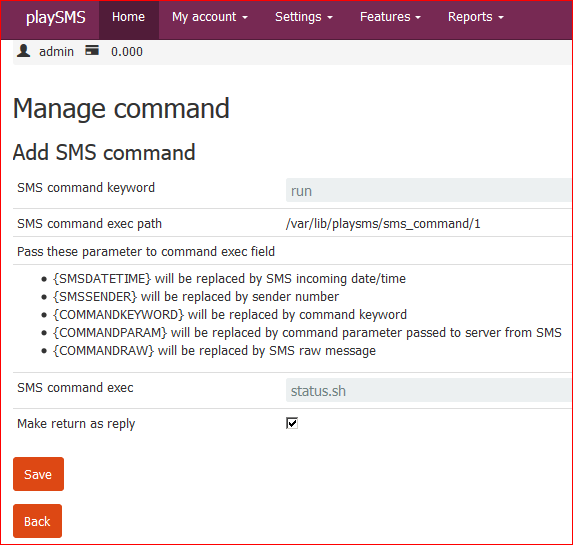 Now at playSMS server console , goto /var/lib/playsms/sms_command/1 and create simple script like. Save & exit. And also run this command to verify if its working on console fine. and you will be replied back shortly from playSMS with the uptime status. Click on SAVE and click on BACK, MAKE SURE TO click click on STATUS button (which is by default ORANGE means disabled, click it on to make GREEN, ACTIVE, This is important. and here you can see the activity of playSMS in logs at that specific time. 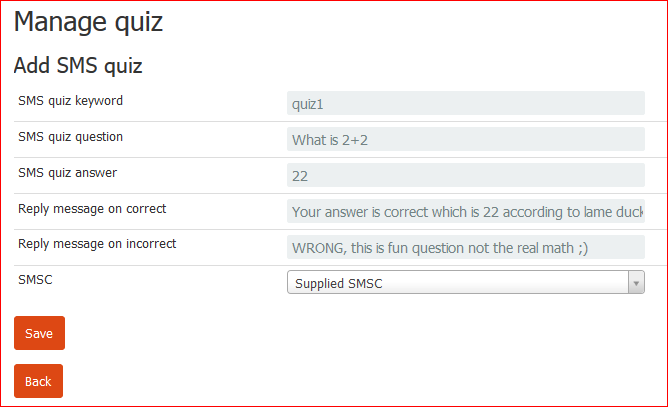 Click on ADD SMS QUIZ, and follow screenshot. Click on SAVE , and then click on BACK, again make sure you click on STATUS icon to make it active otherwise it will remain dead body.